Traditionally, the six series that form the practice of Ashtanga Yoga were practiced consequitvely throughout the week with Sunday as a rest day. The purpose of this asana practice was to be able to be comfortable in a seated posture during meditation. As a result of this, Ashtanga Yoga is a very strong physical practice as it involves unifying the mind, body and soul through the breath and asanas. Sri K. Pattanhi Jois (1915 – 2009) transmitted this form of yoga to the modern world. There are four fundamentals to Ashtanga Yoga – 1. Ujaii breath (the internal heat created within the body as a result of this ocean like breathing), 2. Vinyasas (to reset the body and breath which occur a total of 60 times throughout the practice), 3. Drishti (the place in which to hold the eyes and concentration), and 4. Bhandas (the energy seals and locks within the body which help gain deeper access into the asanas. By encompassing all four of these elements, it makes for a very strong practice. 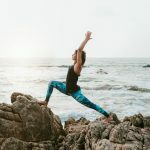 Ashtanga Yoga can be quite a challenging practice for complete beginners and is therefore more suited to those who have prior experience with some foundational asanas. Once the foundations have been established, it can be a very rewarding physical practice. Since the practice follows a set sequence (the primary series) the chance for development and progress is great and it is amazing how quickly these changes start to occur! It is a perfect practice for those who love the discipline and structure, but equally wonderful for those who want to experience the unification of their mind and body as they experience an internal sense of meditation. During the class, modifications will be explained to students who are less familiar with the practice or less able to access the full asanas. Adjustments will be provided for those who would like it. Olive’s ultimate aim is for students to enjoy the practice, and walk away feeling this surge of physical and emotional energy. She likes to make her classes enjoyable and welcoming to all.